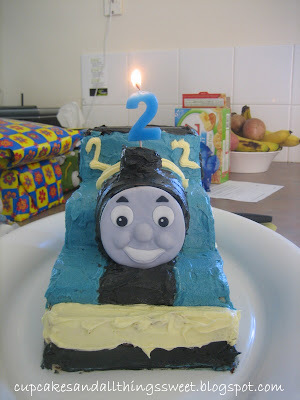 Here is the Thomas The Tank Engine cake I made for my son's 2nd birthday. 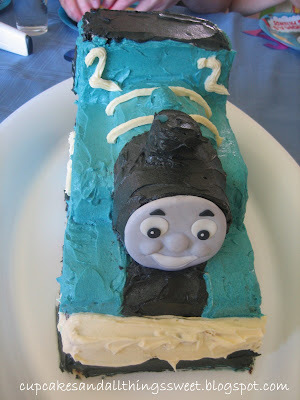 I had made 3 large slab cakes and 1 square cake to carve into Thomas, i was worried there wouldn't be enough cake but there ended up being too much. The cake could have fed 60, there was only 6 of us! We were lucky enough to take the cake that afternoon to a family bonfire but we still came home with some - Thomas was HUGE! Unbeknown to me, I demoted poor Thomas! My husband pointed out that Thomas was the No.1 engine that's why he has a 1 on the side and that I shouldn't change the number - sorry Thomas. I know Thomas doesn't quite look like Thomas. Where's the red and the detail? Well, carving the cake took me one hour because I didn't know what on earth i was doing so when it came to icing, i just slapped it on and did whatever! FYI there's supposed to be 3 wheels in blue icing. Slapped on icing or not, my parent's think i'm pretty cool now! 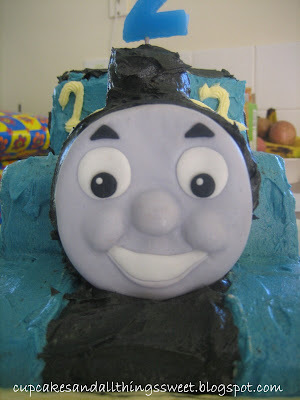 This is a pic of the first Thomas head i made. I got up to this point and i was thinking how wonderful i was when i realised that there was no room for the eyebrows - aaaargh! Back to the start i went. 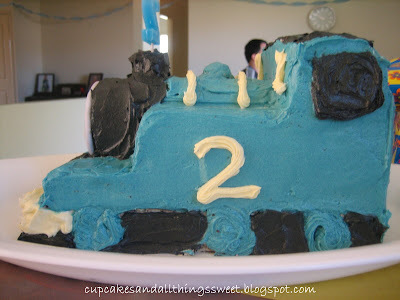 To make this cake i followed the Thomas The Tank Engine tutorial from Cake Space. 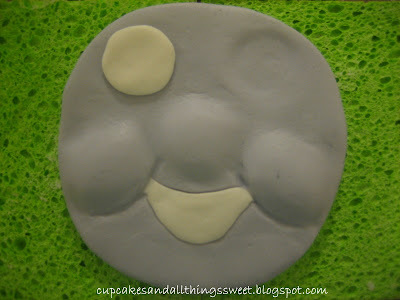 It's a good tutorial although I didn't have time to email questions about measurements so I had to wing it when it came to how much sugarpaste to use for the face etc. Wow. Can I just repeat - wow! I'm sure Thomas is big enough to take the demotion! Amazing job - well done! My kids love Thomas and Friends. I was surprised when i saw this page. Great Idea.